The University of Illinois (UIUC) was not among the 26 comparators selected for InTRO’s initial research. However, the recently created Center for Innovation in Teaching and Learning (CITL) came to our attention as a nationally recognized restructuring of higher education functions which provides a unique perspective on the digital education environment in higher education. CITL combines the personnel, resources, and functions of the former Center for Excellence in Teaching, the pre-existing Continuing Education unit, and the educational technology support functions in Information Technology into one organization. The initiative is the result of a specific recommendation from the faculty advisory committee for IT in alignment with the 3-year strategic plan of the Chancellor and Provost. UIUC offers a large variety of online courses through individual schools and colleges. There are currently 15 online undergraduate degrees, one online undergraduate completion degree, 26 online graduate degrees, and 29 online certificate programs. CITL has spent the past year melding its diverse components into a unified organization and now conducts significant outreach to campus partners to identify areas of growth and support. UI colleges have identified instructional spaces, internationalizing the curriculum, and learning outcome assessment as their initial highest-priority items. CITL’s immediate focus looks to address these items. CITL also works with two student advisory groups: one for Online Degree Programs, and one for Undergraduate Programs. 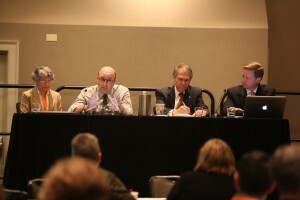 On June 1, 2015, UO staff (Kassia Dellabough, Lindsey Freer, Greg Milton) conducted a conference call with Michel Bellini, Director of the Center for Innovation in Teaching and Learning, Faye Lesht, Associate Director of Academic Programs & Services, and Adam Fein, Associate Director of Instructional Strategy, to explore in greater detail the dynamics of change and development in technology-enhanced programming at the University of Illinois. Three questions were used to frame the discussion, which then developed along lines of interest for the participants. The creation of CITL (combining Continuing Education, the former Center for Excellence in Teaching, and 8 technologists from IT) was the result of a 5-6 year maturation process, including several years of discussion among faculty committees. One of the reasons the process took this long was due to “insufficient leadership” or vision; reorganization moved more quickly once the right campus leadership was in place. The specific combination of units that formed the current CITL was the recommendation of the faculty advisory committee for IT. The activities of CITL align with the 3-year Strategic Plan from the Chancellor and Provost, with a specific charge from the Provost to support creative and innovative modalities from F2F to hybrid and online. Prior to receiving the faculty advisory committee’s recommendation, the leaders of this unit planned to “cherry pick” staff for a new unit; bringing preexisting units together instead has reduced the possibility of being “silo’ed”, but the sheer number of staff involved has created challenges. It has taken the better part of a year for the CITL to develop a unified vision, mission, culture and workflow for the disparate groups which were brought together (credit and non-credit CE, teaching/learning, and technology are still all part of that mission). The process was made easier by having a clear charge from the Provost and from the concept origination with faculty discussion and recommendation. The largest challenge has been finding the physical space to bring CITL personnel together (presumably housed in different locations), with approximately 110 total staff. CITL staff currently operate out of three different physical locations. CITL has conducted significant outreach to academic units and faculty, making questions like “how can we help you” and “what are your priorities” the centerpiece of their approach. CITL has held direct meetings with each college, including deans and interested department heads. They also conducted a faculty survey to assess needs and interest. There are two student advisory groups, one for Online Degree Programs and one for Undergraduate Programs. They also note that they were “not afraid” of embracing their campus’s vision, along with “listening to stakeholders.” This open attitude has gone a long way towards establishing faculty buy-in, as has focusing on the top priorities of the departments and colleges. Becoming a service unit that is perceived as a place where “things happen” goes a long way towards establishing trust internally. The colleges identified instructional spaces, internationalizing the curriculum, and learning outcome assessment as their initial highest-priority items, so CITL’s immediate efforts (including the CITL fellows program) make an effort to address these items. Operationally, CITL internal work groups always include personnel from other units. They have created a CITL Fellows program to embed scholars from campus into CITL, as champions with specific skills sets (Learning Analytics, for example). CITL is in the process of building a dynamic intake process, with a form which can be submitted online and which will initiate a dynamic project management workflow – to plan, track, manage, and report. They have contracted with Workfront to provide the software application and support services. There is some central funding to CITL, but currently they are utilizing an existing business model in process of change. There is a $50/credit ‘operational fee’ for online courses administered by CITL (some online courses/programs are offered by individual colleges/schools without CITL and these do not charge the $50/credit fee). CITL costs are deducted from this fee, and the remainder is distributed to deans and central administration. The budget model change under consideration – based on the argument that online development is the only potential area for revenue growth – is to eliminate the $50/credit fee altogether, and to provide all CITL revenue directly from central administration (assuming this justification means more students will be brought into all UIUC courses with online courses charging the same fees as all other course and increased tuition revenue would be divided in a more standardized way across campus). Dr. Bellini (second from left) speaking about CITL’s development at the UPCEA centennial conference in DC, March 2015. Michel Bellini has led the merger of preexisting continuing education and faculty development units into a new centralized unit for excellence and innovation to support reflective teaching in multiple modalities. According to Dr. Bellini, faculty are excited about working with the new unit. One of the biggest surprises at UIUC is that being asked to “fly a plane while building it” actually worked, that the new mission has increased general sense of possibility as well as the university’s willingness to make a significant financial investment. Working with 3rd-party vendors requires careful evaluation of contracts—be sure not to end up at a pedagogical/IP disadvantage, and think carefully before putting vendors in direct contact with students. However, 3rd-party vendors can sometimes do what you cannot—so do not rule it out entirely. CITL holds an annual one-day Faculty Retreat on Teaching and Learning, featuring a keynote speaker, concurrent sessions by faculty and poster sessions to highlight faculty research on teaching and learning. The goals for the retreats are to build on collective knowledge among campus faculty, to share innovative ideas and approaches to enhance teaching and learning, and to develop and promote partnerships within and beyond the campus community. All material presented here is based on the assessments of InTRO staff, made through the collection of publicly-available data and through a small number of conversations with staff at peer institutions. All statements and opinions here remain those of InTRO staff, formed in order to address needs and questions specific to the University of Oregon. Copyright © 2019 InTRO 2015 Report. All Rights Reserved. Designed by bavotasan.com. This site is maintained by the authors for personal and professional communications as authorized by the University of Oregon’s computer use policies. Unless otherwise indicated, the content and opinions expressed on this web site do not necessarily reflect the views of nor are they endorsed by the University of Oregon or the Oregon University System.